The Short Version: Speed dating has been around since the 1990s, and so many modern singles dismiss it as outdated and tedious. 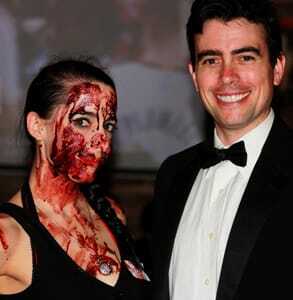 But, in August 2015, Abel Horwitz gave speed dating a makeover by creating horror-themed events for singles seeking a good time. Serial Killer Speed Dating brings eye-catching intrigue to the dating scene and invites attendees to solve a mystery by finding the fake killer in a crowd of dates. Single men and women chat for five minutes, vote for who they think is a serial killer in disguise, and laugh when the big reveal caps off the night. Daters who fancy themselves experts at reading people can put their skills to the test at a Serial Killer Speed Dating event, and, if they play their cards right, they might just come away with a killer date as well. You know that feeling you get when sitting across from a complete stranger on a blind date? Like, kind of excited, kind of nervous, and kind of terrified that it’s all going to go terribly, horribly wrong? When I first started dating, butterflies would cartwheel in my stomach as I tried to figure out if the guy across from me was crazy about me — or just plain crazy. Nowadays though, my dates don’t faze me. I’ve gotten used to the uncomfortable vulnerability of meeting a stranger in person. That’s just my Tuesday. I don’t sweat it at all, and that takes the terror and anticipation out of the experience. Abel Horwitz founded Serial Killer Speed Dating in 2015, and his events brought a creative twist to a long-standing dating process. Dating has a lot of built-in drama, but it can get stale for date veterans who’ve gone through those emotional highs and lows many times. Fortunately, to spice things up, actor and writer Abel Horwitz has devised an ingenious event that combines elements of a murder mystery theater with speed dating. He calls it Serial Killer Speed Dating. Based in Los Angeles, these events have delighted local singles since 2015. Abel said the idea came to him because he wanted to organize an event for Scare LA, a popular horror convention. He thought a speed dating event would be perfect because it would introduce single attendees to dates who share a common interest in things that go bump in the night. At a party, Abel explained his idea with the creator of the convention, who also happened to be a close friend. She said he needed some sort of pull, something to tie the event back to horror. Another friend jumped in, saying “Throw in a serial killer!” And so Abel did. After the first event, everyone agreed that Serial Killer Speed Dating was a lot of fun. Abel began hosting similar events every few months to help bring single men and women out of their shells. He said most attendees are 20-something or 30-something singles who feel drawn to the off-kilter, morbid, and comical tone of Serial Killer Speed Dating. As a die-hard horror fan, Abel enjoys the thrills, laughs, and groans of a good haunted house or a camp murder mystery. After years of working with a theater group called Zombie Joes Underground, Abel saw firsthand how a good scare can bring a couple closer together and get new friends talking excitedly about how real the fake blood looks or what’s coming around the corner. Singles at Serial Killer Speed Dating have the chance to solve a mystery while seeking a date. Abel’s positive experience convinced him that he could offer daters an even more engaging time by adding a murder mystery element to speed dating. He figured, you’re there trying to get to know people anyway, so there may as well be some game to it. His first Serial Killer Speed Dating event made a killing — over 80 people showed up, many of them curious about how the event would work. When a theatrical and cheesy murder took place to start things off, everyone started laughing and cheering. The ice was broken, and a night of mystery and romance began. Serial Killer Speed Dating keeps to many of the standard speed dating practices. Singles show up at a private room in a restaurant, bar, or meeting space, and have five minutes to chat with one another before moving on to the next person. At the end of the night, attendees mark down who they’re interested in seeing again. Abel then follows up with people for permission to share their email addresses with their mutual matches. Abel shows up to the events wearing a tuxedo because, as he says, you have to be classy. He gets everyone signed in and introduces the game element to the event — which kicks off with a dramatically staged murder. Every Serial Killer Speed Dating event kicks off with a blood-curdling scream. Serial killers are hiding among the attendees, Abel explains, and the daters’ job is to root them out and vote for who they think the “killer” is. At the end of the night, those who guess right will get a prize. Plus, the two daters with the most votes win The Golden Rat trophy (a plastic dollar-store rat spray painted gold) for being the Most Likely to Be a Serial Killer Without Actually Being a Serial Killer. The room often fills with gasps and applause when Abel asks the “real” serial killers to step forward. 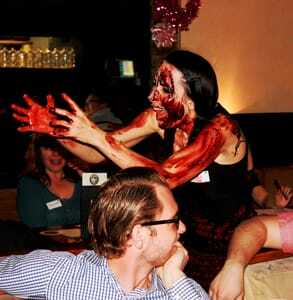 Note: Serial Killer Speed Dating is designed to be a little campy, a little tongue-in-cheek, and a lot of fun. It’s a playful way to meet a bunch of new people who have a similar sense of humor, think Halloween should be celebrated year round, and don’t take themselves too seriously. Abel told us he hopes to franchise his idea so singles all over the country can enjoy Serial Killer Speed Dating, but, for now, he’s content throwing his own fun events every few months and watching attendees loosen up together. Although Abel is still hoping for an email inviting him to a wedding from two people who met at his event, he said he has heard many stories of people dating and even falling in love at Serial Killer Speed Dating. One single woman didn’t find her match at the event, but then met a guy on Tinder who’d won Most Likely to Be a Serial Killer Without Actually Being a Serial Killer. She saw the Golden Rat statue in his apartment, and she couldn’t help but exclaim, “I won that, too!” Turns out, they had more in common than they’d thought. 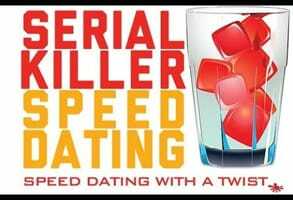 Serial Killer Speed Dating: It’s to Die For! It’s so easy to get stuck in a rut as a single adult. As I go from one indistinguishable date to the next, I can’t help but wonder “Where’s the mystery? Where’s the excitement? When’s the good part going to get here?” I want to go on dates that get my heart pumping and mind racing — and that’s why Abel’s macabre take on speed dating is so compelling to me. It may be ghoulish, but at least it’s original! 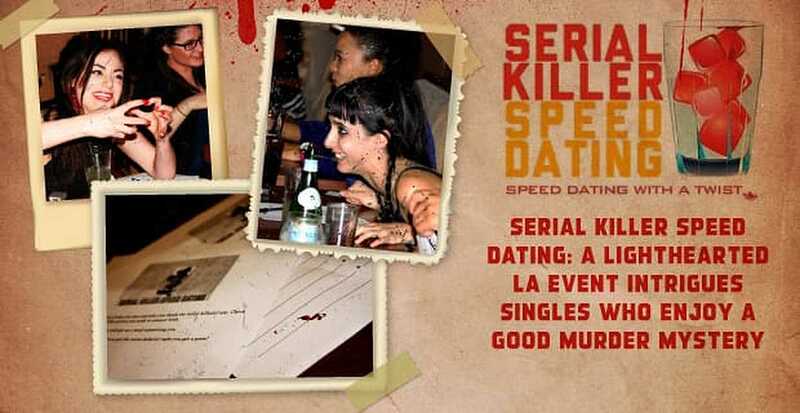 If you’re in LA, you can sign up to the mailing list to find out about the next Serial Killer Speed Dating event and liven up your dating life with a good murder mystery. These events offer an engaging way to break the ice, have a good time, and meet quirky singles in your area. Whether you come away with a date or a prize for guessing who the actor was, you’ll definitely have a night to remember at these frighteningly fun speed dating events.